The people of Manchester voted the over century-old venue their favourite place to experience live music via a public poll in Manchester’s entertainment bible City Life. Readers of City Life voted in their thousands for their favourite restaurants, bars, pubs, theatre shows, comedy clubs, club nights and bands, who were honoured at a ceremony at the Deaf Institute on Monday 28th January 2019. 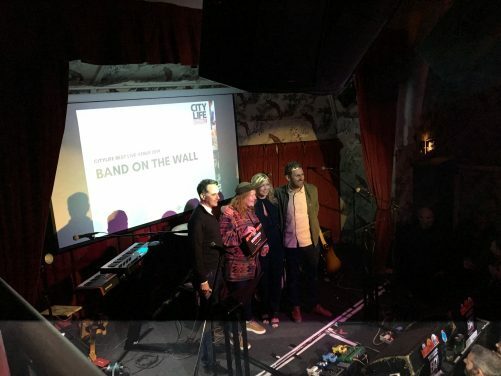 Band on the Wall beat competition from shortlisted nominees the Albert Hall, Gorilla, Soup Kitchen and YES to be crowned Manchester’s Best Live Venue. The award follows a win at the same ceremony in 2018, in which our Craig Charles Funk & Soul Club residency with the presenter, actor and BBC Radio 6 Music DJ won Best Clubnight. There are plans to further expand the historic venue into the currently derelict ‘Cocozza’ building to the rear of the current building. The expansion plans see the main venue capacity increase from 350 to 500, significantly improved facilities for education and community engagement programmes, and the bar remodeled with external terrace space increased and a new small second venue for emerging artists. New learning spaces will be home to Band on the Wall’s improved archive facilities, enabling the organisation to better catalogue its rich library of historical content. We’d like to say a big thank you to everyone who voted, our fantastic customers and the people of Manchester. Photo: City Life / Manchester Evening News.